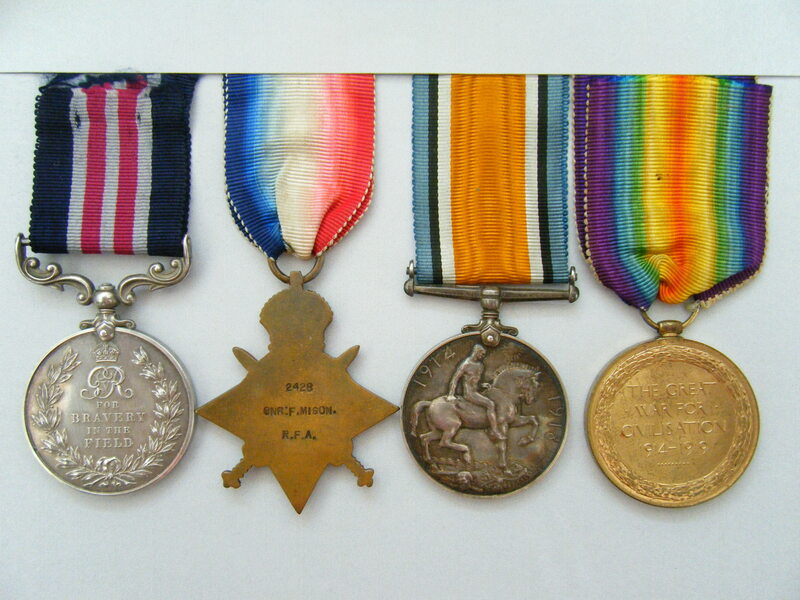 WW1 Military Medal group awarded to 2428 Gunner (later Bombadier, then Sergeant) Frederick G. Mison who served with the 7th Reinforcement Brigade, Royal Field Artillery and later, with ‘B’ Battery 123rd Brigade Royal Field Artillery. Military Medal named to 2428. BMR. F. MISON. B.123/BDE. R.F.A. 1914 Star named to 2428. GNR. F. MISON., R.F.A. 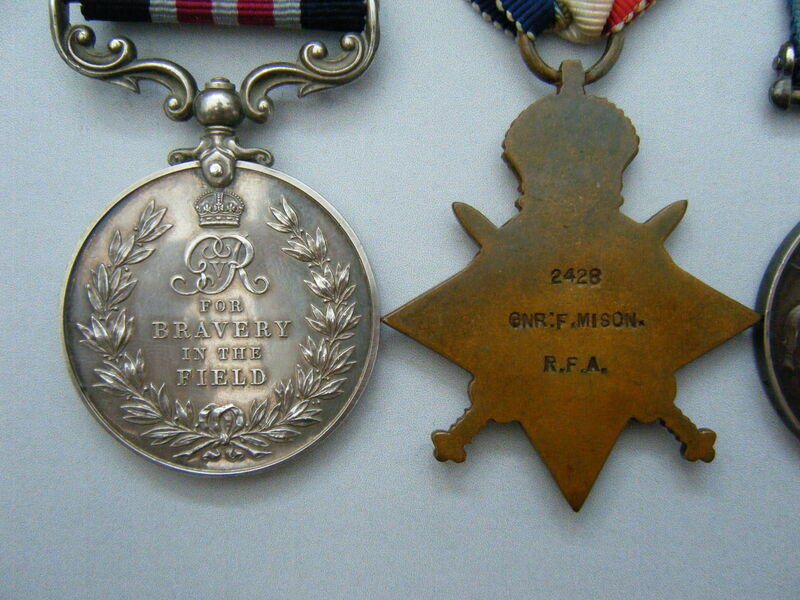 British War Medal and Victory Medal named to 2428. SJT. F.G. MISON. R.A. 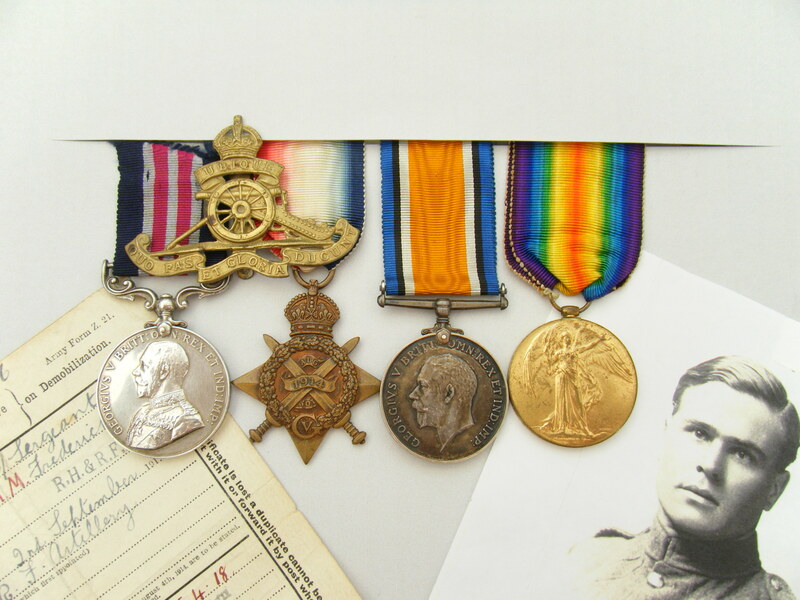 The medals come with original ribbons, his original Certificate of Demobilisation and a copy photograph of him in uniform showing him wearing a ribbon bar with the MM. Also included with this listing is a printed copy of the Medal Index Card which can also be viewed by clicking on here (if you have access to Ancestry). A link to the reference to his Military Medal ‘Index Card’, can be viewed by clicking on here, (again if you have access to ‘find my past’), however, a paper copy is also included. I have been unable to identify any service records relating to this man. Mison was born in 1894, and was a pre-war reservist who enlisted (from the reserve) on the 2nd September 1914. He was attached to the 7th Reinforcement Brigade RFA, and entered France (according to his Medal Index Card) on the 14th September 1914. 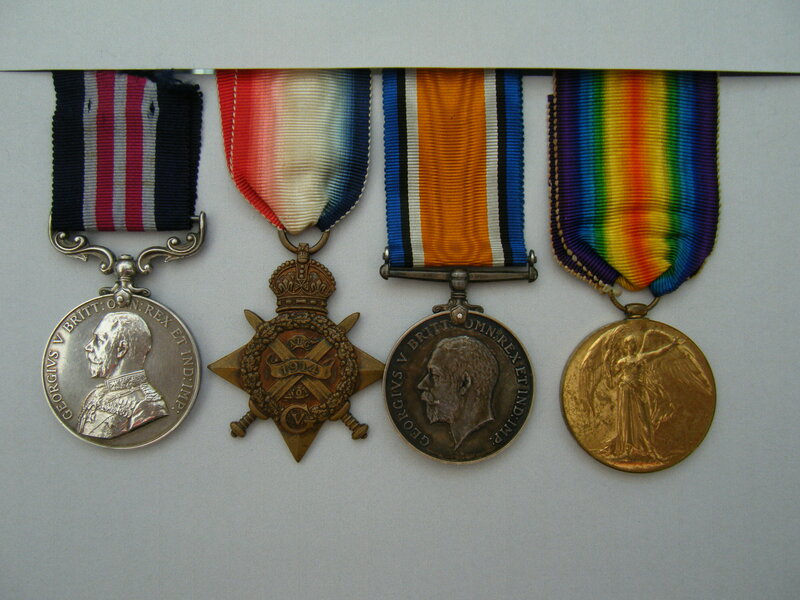 Mison was awarded his Military Medal in 1918, which was gazetted on 25th April 1918 and can be viewed by clicking on here. A paper copy of this entry can be supplied if required. His MM is engraved with details of ‘B’ Battery, 123rd Brigade RFA. The 123rd Brigade comprised of A, B, C and D Batteries RFA and the Brigade Ammunition Column and were initially assigned to the 32nd Division upon entering France. From the 15th April 1915, they were transferred to the 37th Division. The batteries were all armed with four 18-pounder field guns. The brigade remained with 37th Division throughout the rest of the war. Activities undertaken while with the 32nd Division can be viewed by clicking on here and the 37th Division by clicking on here. At the time of Mison’s Military Medal award, the division was taking part in the first counter-actions against the German Spring Offensive and in April 1918 and was engaged at the Battle of the Ancre, which included the world's first tank versus tank combat at Villers-Bretonneux, details of which can be viewed by clicking on here. According his certificate of demobilisation (which is included with this listing), Mison appears to have been demobilised from the army back to the reserve on the 23rd January 1919, however, a hand written note on the same document, indicates that he ‘signed on’ again for two years at Whitehall on the 29th April 1919. He is shown on the 1914 Medal Roll as not entitled to clasp and roses as can be viewed by clicking on here (if you have access to Ancestry), although it does confirm his date of entry into France, and interestingly, does not show him as being discharged, partially confirming his re-enlistment. Please note that all listings that are sold will remain on the site for 14 days after the day of postage to allow access to the links that are contained within each of the separate listing - after this time, the listing will be removed from the site. Any documentation that is available on the net ‘free of charge’ will not be printed and included with your listing when it is posted to you. All pay to view documentation; such as ‘Ancestry’ held documents, will be provided as a part of the price paid for the listing (unless specifically excluded). Postage, £5 Recorded Delivery for orders under £40, £10 Special Delivery for orders over £40, Overseas £15.00. Payment types accepted, £ Sterling or € Euros cash, Sterling Cheque, Sterling Bank Transfer, Paypal, (but please add 4% to the total for Paypal based transactions).